So who were the indigenous people of the Cape, watching in silence as the European sailing ships slipped into Table Bay? It’s a question that usually makes people frown, scratch their heads and say “hmm…” There were people here all right – tens of thousands of them – but today their language is no longer heard and their culture and history almost entirely obliterated. The people standing in the shadow of Table Mountain are slimly built, their eyes narrowed from the sun. Their cheekbones are held high to accommodate the wide smile they give so effortlessly and their skin is the colour of honey in sunshine. They begin to talk amongst themselves, a potpourri of clicks and tuts – the sounds you make when greeting a horse or trying to call the cat in from the garden. They were the Khoisan (pronounced “COY san”) and they once lived across southern and eastern Africa, leaving behind rock paintings, ostrich-shell jewellery and mounds of limpet shells. Broadly divided into two groups – the Khoikhoi (who had livestock and were often semi-settled) and the San, or Bushmen, who were primarily hunter-gatherers, living off the coast or roaming the interior. 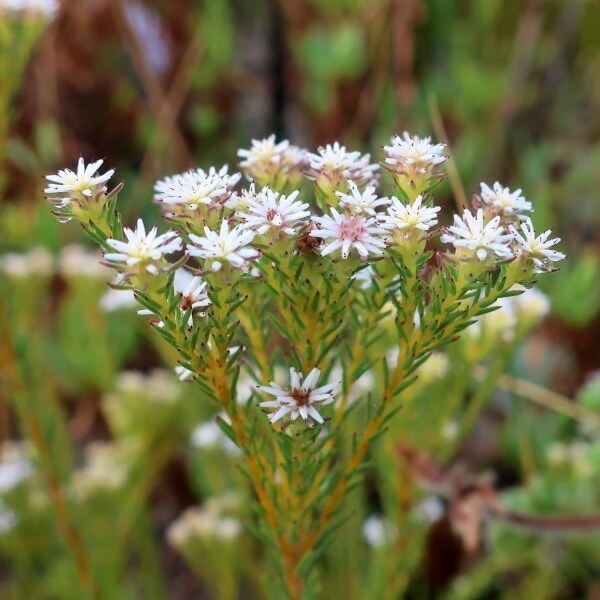 Thin, bendy plants like Staavia radiata were used by the Khoisan & later by the European settlers as feather dusters. Image Nick Ashby. And they had been around for a long time. The ancestral Khoisan were once the world’s biggest population of humans, and the south-western Cape makes a solid claim as the place in the world where modern humans – Homo sapiens – have existed the longest. We’ve been enjoying the view from Table Mountain for anything over 150 000 years, long before we made it to Australia or the Americas. Unravel your DNA and you’ll find the Khoisan. 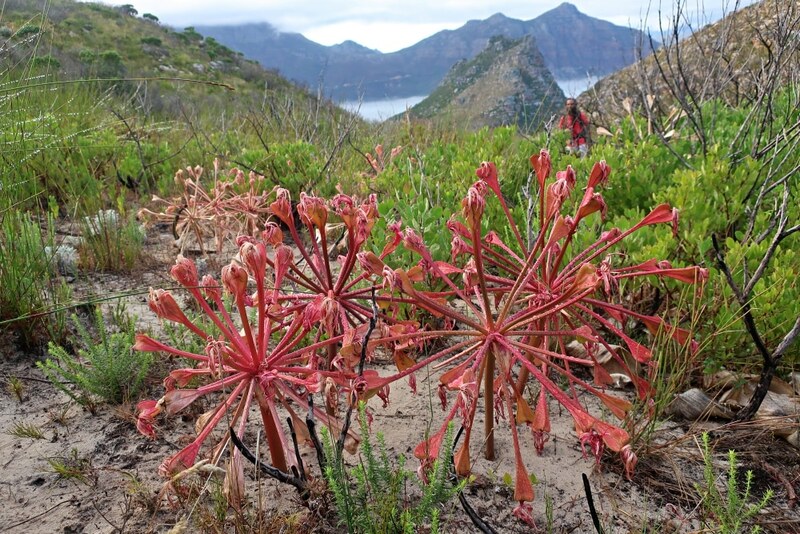 The extraordinary Candelabra Lily (Brunsvigia orientalis) makes a startling appearance, bursting through soft sand to flower in late summer. Image Nick Ashby. What happened to them? Jared Diamond’s ‘Guns, Germs and Steel’ is the obvious culprit – the pulverising effect of western colonisation. Already on the retreat in the face of black farmers moving into the region from central Africa, the Khoisan were powerless against bullets, smallpox and the plough. Conventional history has pure-blood Khoisan dying out by the late Victorian era, the survivors mixing with both black and white populations to emerge, dazed and blinking, into the modern world as the ‘coloured’ people. Taking in the view: looking west over the Atlantic Ocean from the Karbonkelberg – next stop… Uruguay. Image Nick Ashby. But the Khoisan are still here. Their clicks and clucks made their way into black languages like isiXhosa and Sesotho, and their words enrich our everyday vocabulary: ‘dagga’, the local term for marijuana, kudu – the antelope, and ‘eina’ – the word that South Africans use when they accidentally hit their thumb with a hammer. Khoisan places can be seen on our road signs – Namaqualand, the Karoo, the Outeniqua Mountains – and we make drinks, perfume and medicine from their plants: rooibos tea, aloe gel, geranium oil and buchu brandy. And they still walk the mountains of the Cape. 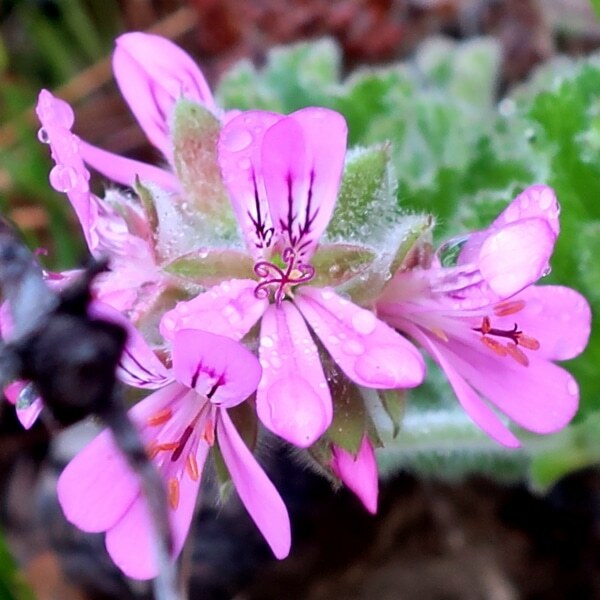 The simple beauty of Pelargonium myrrhifolium is hard to ignore – it’s a type of geranium. Image Nick Ashby. 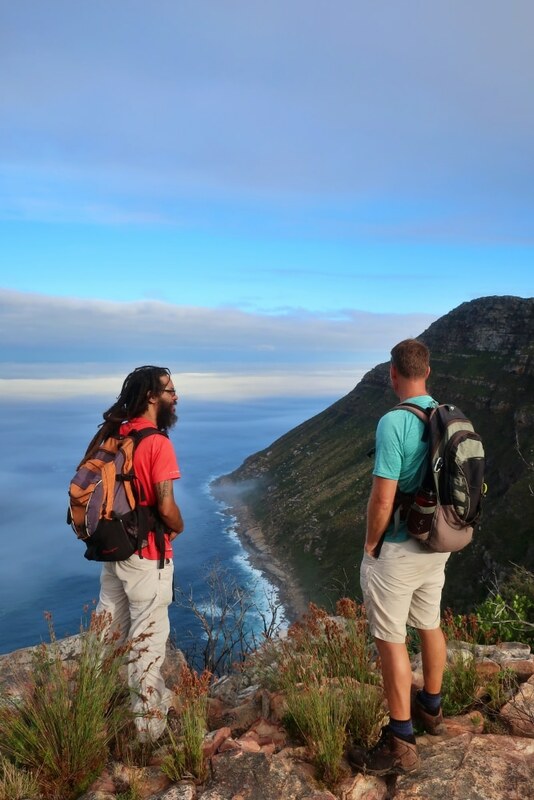 I was with Johan October, hiking on the Karbonkelberg, a higgledy-piggledy mountain behind Hout Bay just 20 minutes from Cape Town. Fellow guide Nicholas Ashby took the photos. 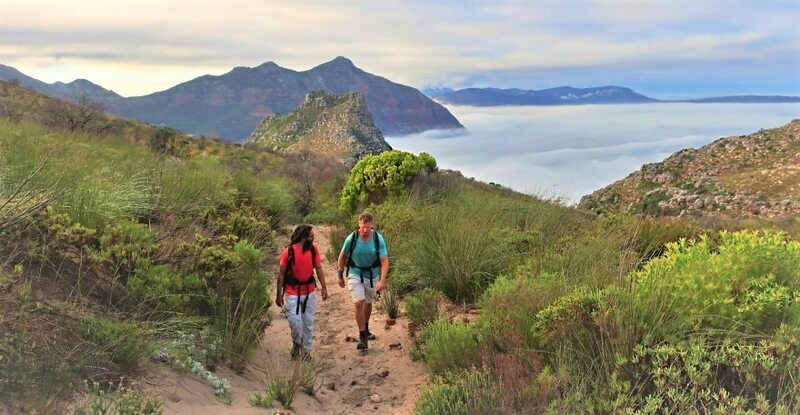 It’s a wild and remote part of the Cape Peninsula, something that was obvious by the scale of birdsong we heard as we walked – much more than normal – and the fact that the only footprints in front of us were those of mongooses and lizards. 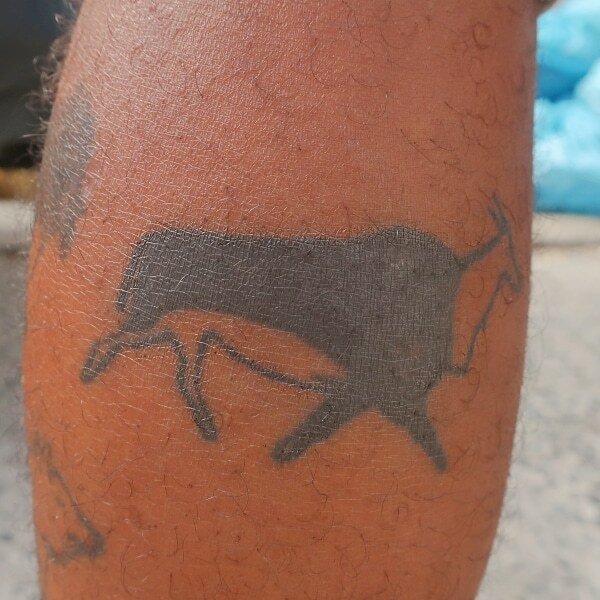 Johan’s eland tattoo carries significance: 90% of animals depicted in Khoisan rock art are elands – this giant-sized antelope was central to human survival in the Cape. Image Nick Ashby. Johan – demographically classified as ‘coloured’ – smiles at the term. He considers himself Khoisan, as do many local coloured people. Far from being the by-product of western colonisation, he sees himself merely as the continuation of his ancient lineage, albeit with Afrikaans as his first language. 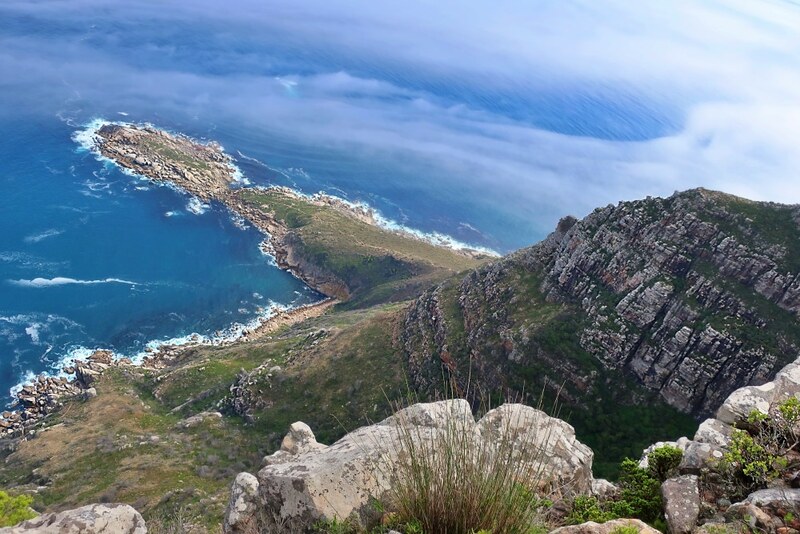 The views from the Karbonkelberg are some of the most dramatic on the Cape Peninsula, a destination itself blessed with postcard scenery from top to bottom. Image Nick Ashby. He moves lightly through the fynbos, echoing bird calls with uncanny similarity. A pair of ravens followed us for a while. Born and raised on the edge of the mountain, he knows the Karbonkelberg intimately and took us to viewpoints that stunned even me into silence and I get to see a lot of views. And I don’t like being silent. 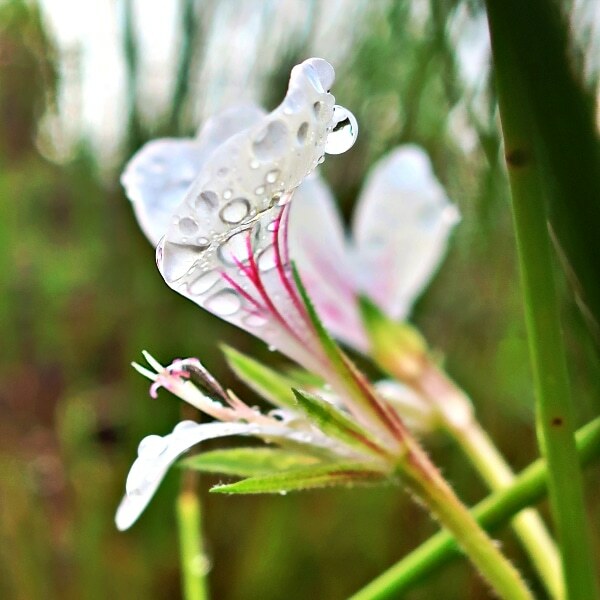 He showed me plants that were part of his childhood – ones to eat, others to cure illness. 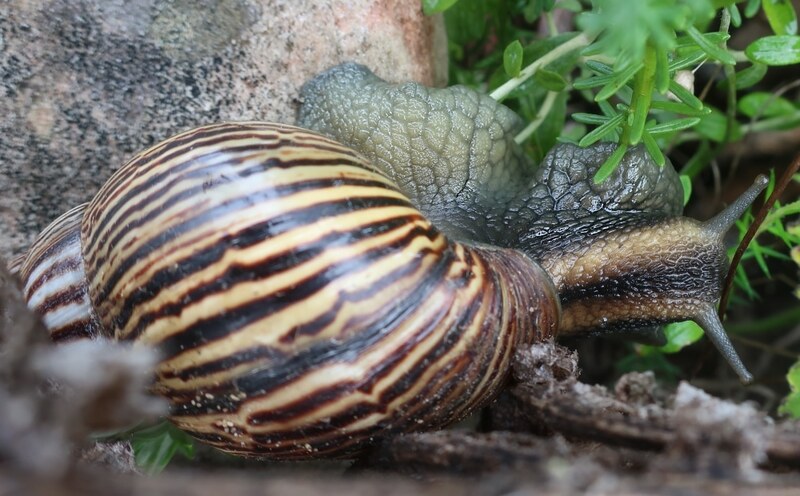 We found a Giant African Land Snail (Achatina fulica), a gastropod the size of your fist & capable of living for a decade. Believe it or not but this snail is a popular pet in some parts of the world. Image Nick Ashby. The soft sprawling leaves of Pelargonium capitatum smell like roses when crushed; this plant was once used to perfume our bodies. Image Nick Ashby. As we head for home, he talks about the plight of his people – forgotten by all sides of the political spectrum and marginalised by developments that don’t include them. Not surprisingly, much of his community is impoverished and social challenges are acute. 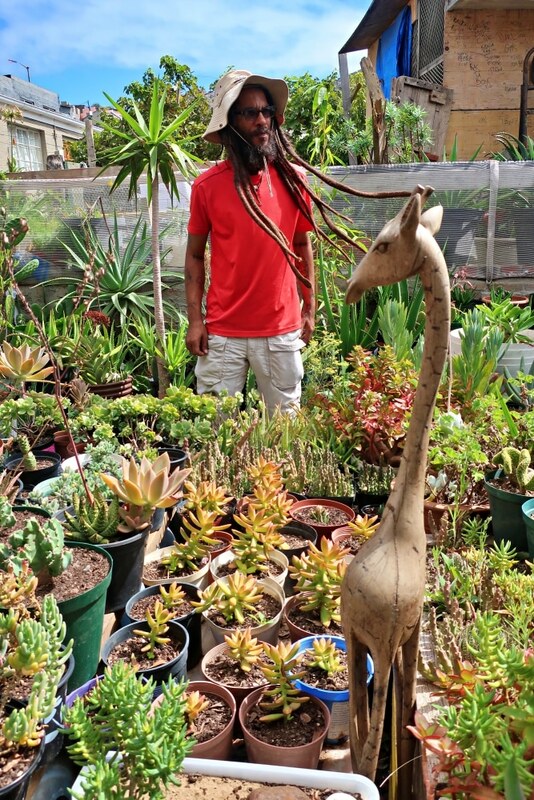 Johan surrounded by his happy succulent plants – somewhat incredibly, South Africa is home to nearly half the world’s succulents. Image Nick Ashby. We arrive however to a friendly welcome of fist-bumps and tail-wagging dogs. Johan owns and runs a plant nursery with what must be the healthiest, happiest looking succulent plants I have ever seen. It’s a Rastafarian commune of sorts; don’t be surprised – there’s an interesting bond between coloured Rastas and Khoisan identity – perhaps it’s a partly a belief in things earthy and natural. We talk some more and then it’s time for me to go. I load up on his plants, clutching an armful of gleaming treasures like a child at Christmas and ask him for the invoice as we walk out. Johan just gives me one of those cheek-to-cheek smiles, waves and disappears back inside. Wonderful article, very informative. I hope we can engage Johan when we return to SA (maybe 2020! ).